Title: Where Shall It Go? 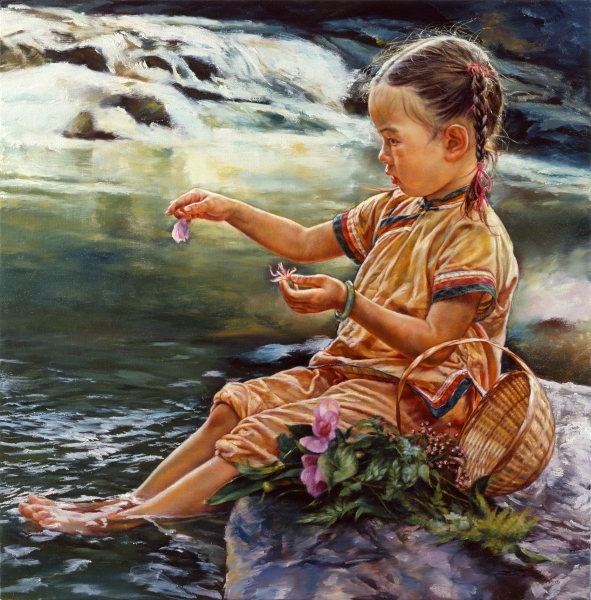 Description: A beautiful little girl, sitting on a rock, puts her toes in the water, and enjoys the cool, comfortable feeling of the water flowing between her toes. A basket of flowers sits beside her, tilted on its side, the flowers spilling onto the rock. She feels at ease in this quiet and peaceful place, as she daintily plucks the petals off a flower and drops them into the water.